Mark Ridgers hailed Caley Thistle's team spirit in their 3-3 draw with Queen of the South. 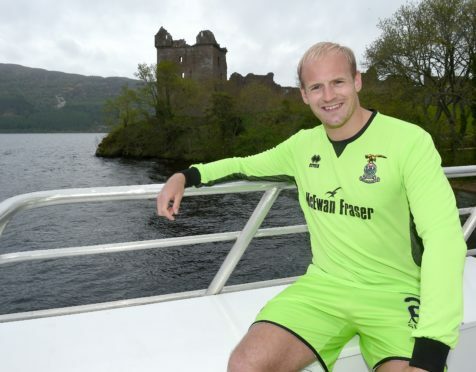 Caley Thistle goalkeeper Mark Ridgers says his side’s incredible comeback against Queen of the South highlights his side’s character after Inverness salvaged a 3-3 draw at Palmerston. Inverness had deservedly trailed 3-0 after an hour in Dumfries but three goals in the space of 10 minutes saw the Highlanders extend their unbeaten Championship run to 25 matches in a sequence which stretches back to March. Ridgers believes the refusal to accept defeat shows the mental strength within John Robertson’s side. He said: “I’m trying to think back and I don’t think I’ve been involved in a game like that. “It was crazy. They deserved it for around 70 minutes and then that one goal changed the whole momentum. “We just stepped up and started playing and got the point from it. It has ended up being a crazy game of football – we could have won it. That’s the scary thing. “It’s testament to the boys we have and the character we have in the dressing room at the moment. “To get a point from that after being 3-0 down just shows what we’ve got. It just shows the character we have in the team – we don’t accept defeat. That’s 25 games now, which is incredible. “The fact we had a great chance at the end to win the game is frustrating but I think everyone would agree that at 3-0 down, to take the point, we’d have snapped your hand off. Ridgers protested Lyndon Dykes’ opener, claiming the Queens attacker handled the ball.